Effective April 10, 2016, the United States Postal Service will reduce the prices of it's first-class mail. 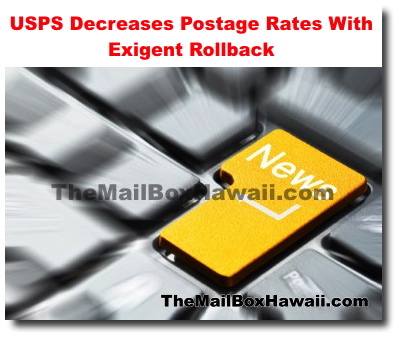 This rate reduction reverses the January 2014 emergency/exigent increase granted by the Postal Regulatory Commission on mailing products and services which increased an average of 4.3%. This was aimed to help USPS recover from the financial losses from the Great Recession of 2008-2009. But the exigent increase was temporary and limited by a cap of about $4.6 billion in extra revenue. This rate reduction impacts only "market dominant" mail (mostly letters, large envelopes/flats, and postcards) and will not affect shipping products like Priority Mail or parcels and packages. To view all the rate changes, visit the USPS Postal Explorer.